CES 2019 offered up a lot of 3D hologram displays as they continue to be a popular item with trade show exhibitors. 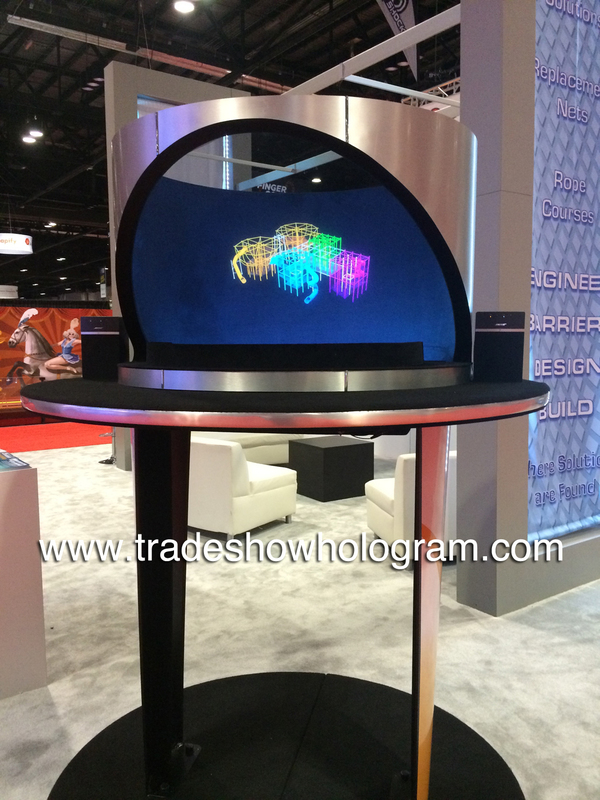 Trade show holograms is a company that specializes in custom built hologram projectors. Hologram designer, Timothy Drake recognized both the strengths and weaknesses of standard hologram displays. Based on 25 years of optical illusion experience Drake has created what he considers the absolute best hologram projector on the market today. The companies holograms have been exhibited globally in over 15 countries. Sales and rentals are offered world wide but focused primarily in the USA. A Trade Show Hologram projector features Drakes ” Ultra Bright ” technology which allows the exhibit to project bright and clear 1080p projections in a bright trade show environment. The projection is also much larger than the standard sized hologram display on the market. For this reason it is much more visible from a distance to attract attention to a trade show booth. Brighter, clearer images attract more attention.. its as simple as that. Both Narrative and Animation are used in each presentation. The interactive display can feature up to 9 separate presentations on each side. They are accessed on demand with a simply touch of an icon on the touch screen. Viewers can watch an animated presentation while hearing narration related to what they are seeing. The audio works in the same way…. the audio is only heard on the side its meant for. Interactive 3D Holographic Projector at SuperCorr Expo Trade Show in Orlando FL. 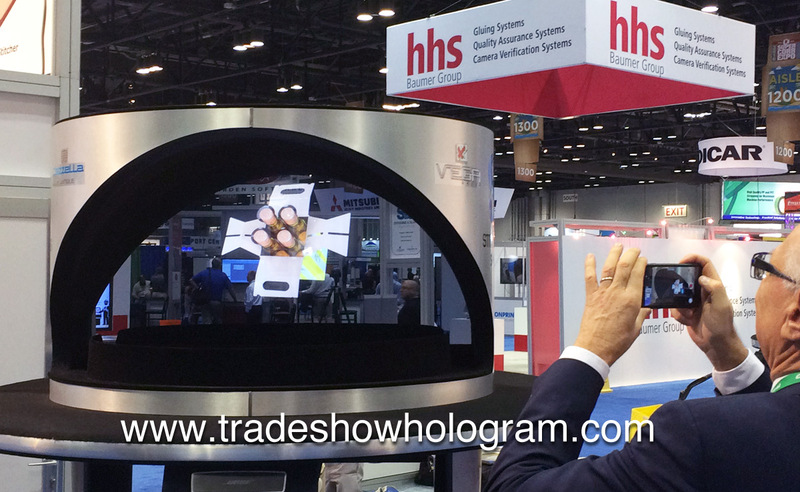 The latest interactive dual sided hologram projector from Trade Show Holograms was recently exhibited at SuperCorr Expo 2016 at the Orange County Convention Centre in Orlando FL. SuperCorr Expo is an annual trade show devoted to the cardboard and packaging industry. This dual sided display features interactive touch screens on both sides allowing visitors to the display to access on demand holographic presentations via a simply touch of the touch screen. The dual projectors are aligned in such a way as to allow a viewer on one side to see and hear the 3D presentation of their choice while a viewer on the opposite side can access, view and hear a completely separate presentation on their side without interfering without opposing presentation. The dual sided nature is the part that has most people baffled says Timothy Drake, the creator of the new dual system. ” They just can’t seem to understand how its possible, but it is. Its proven a very popular way to attract attention to a trade show booth, and keep it.” The dual sided nature of the exhibit doubles the interactivity of the available floorspace which is a bonus in the trade show world. ” Its all about maximizing floor space use” says Drake. Drakes company Trade Show Holograms offers the displays for sale and rental across North America at trade shows and special events. A newly enhanced 3D projector exhibit was featured as part of the IAAPA Trade Show in Orlando Florida in mid November of 2015. Trade Show Holograms decided to test the upgraded technology at this show because the product being displayed called for both brighter projected images as well as a finer detail. The new upgrades resulted in a full HD video projection as well as a 50% brighter/sharper image. The new enhancements had been tested in studio conditions but this was its first test under the very bright lighting environment of a working trade show. Trade Show holograms offers a wide variety of 3D hologram projectors for trade shows and conferences across both the USA and Canada as rentals and for sale. Holographic images appear to float in mid air in these attention getting displays that include full animation as well as audio effects. The video of this display can be viewed here. 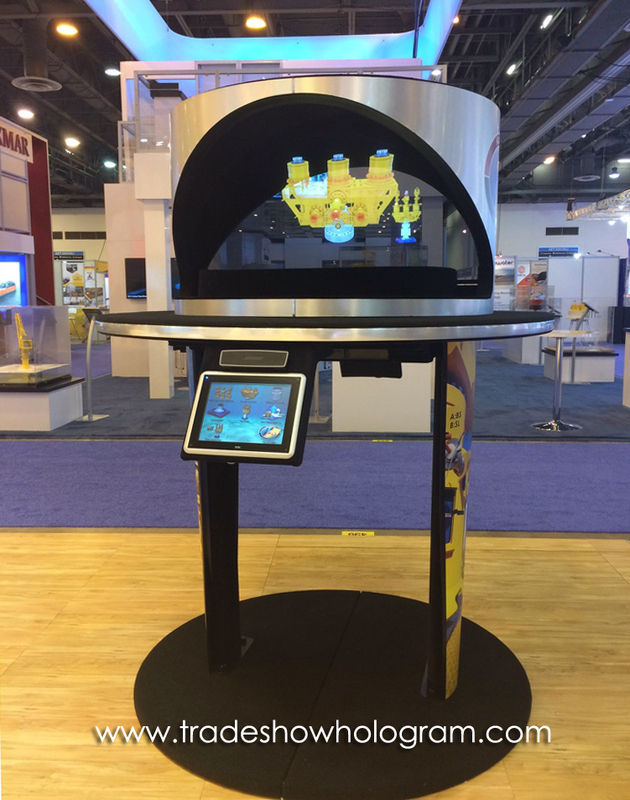 Trade Show Holograms debuted their latest design in 3D hologram projectors at the CIM 2015 Convention in Montreal on May 9 – 13, 2015. The new large scale hologram projector boats a hologram image 3 ft tall by 5 ft wide. In addition to the holographic image floating in mid air are 3 standard video monitors to display more detailed product information. SEW Canada featured the new design as part of their 2015 booth and labeled it ” The hit of the show!” . They had the honour of being the first to debut the new design as the display was featured at a Chicagos NRA show the following week. The display , created by Trade Show Holograms can be purchased or rented across North America to trade shows and special events. In this photo Fiona ( the virtual spokes robot ) can be seen presenting the clients logo in holographic form. A new design of a large 3D hologram projector is featured at the CIM 2015 show. Holographic Projection displayed in 3D at trade show. Trade Show Holograms presented a 3D holographic presentation at the NEST International booth in Orlando FL as part of PRSM 2014. The hologram projector was deemed ” A Huge Hit! from NEST staff manning the booth. The fast paced mix of visual and audio effects created a vibrant 3D presentation floating in mid air without the use of any special 3D glasses. 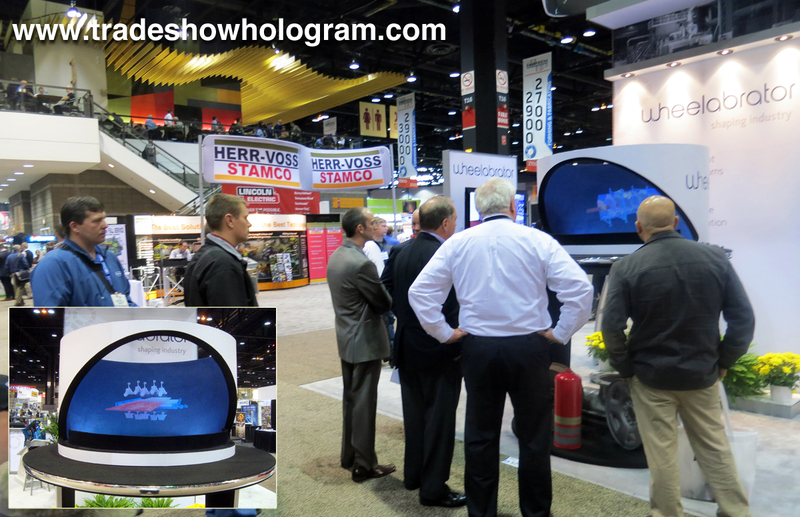 The displays are available as both rentals and sales from Trade Show Holograms in both the United States and Canada. Holographic 3D images float in mid air. The Holographic Projections are most often displayed in trade show use but are also used for special events, press releases, keynotes and product launches. 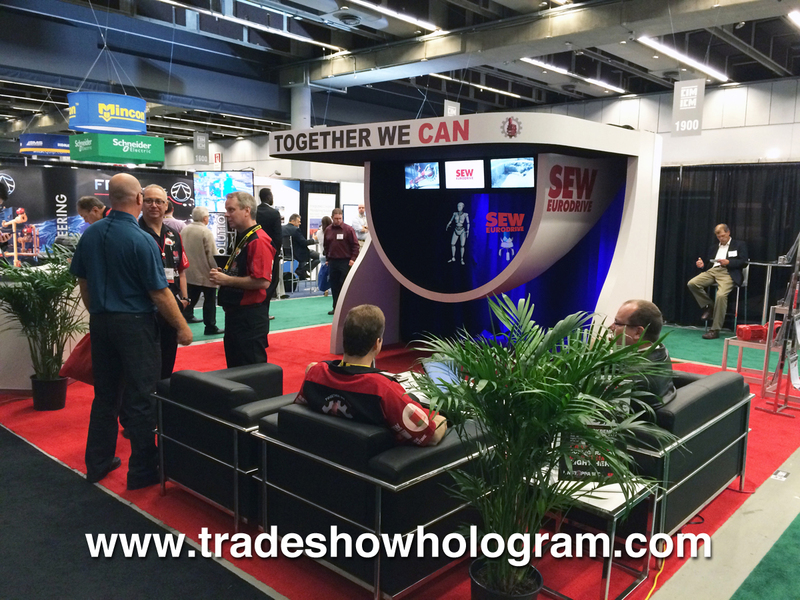 Hologram Projector draws attention at trade show booth. Holographic Projection Exhibit Displayed at Chicagos FABTECH 2013 show. Fabtech 2013 was held at Chicago’s McCormick Centre in November. Among the displays was a 3D hologram projector featuring product lines belonging to Wheelabrator. The exhibit was provided by Trade Show Holograms and proved to be a big hit in attracting attention to the Wheelabrator booth. The exhibit features full animation and an audio soundtrack. No 3D glasses are required to see the 3D effect. Trade Show Holograms offers a wide range of available sizes of holographic projectors available for both sale and rental across the USA and Canada. 3D Holographic Projector projects Hologram at IAAO 2013 trade show in Grand Rapids MI. When Tyler Technologies wanted to highlight the perks of their new software the chose to do it via a 3D Hologram. Trade Show Holograms developed the 3D special effect for the Tyler booth at the IAAO 2013 held in Grand Rapids MI. The Holographic Exhibit offers viewers a 3D presentation without the use of any special glasses. The effect is quite amazing and attracts attention to a trade show booth. Trade Show Holograms has created a wide variety of holographic presentations ( for sale and rental ) of all shapes and sizes for special presentations, conferences, trade shows and press events across the USA and Canada. Hologram Projector for Trade Shows – 3D Projections float in mid air. Holographic Projections are a guaranteed way to attract attention to a trade show booth. 3D Hologram projectors create holographic video and images that appear to float in mid air. The hologram projections feature a wide range of colors as well as music and sound effects to enhance the viewer experience. 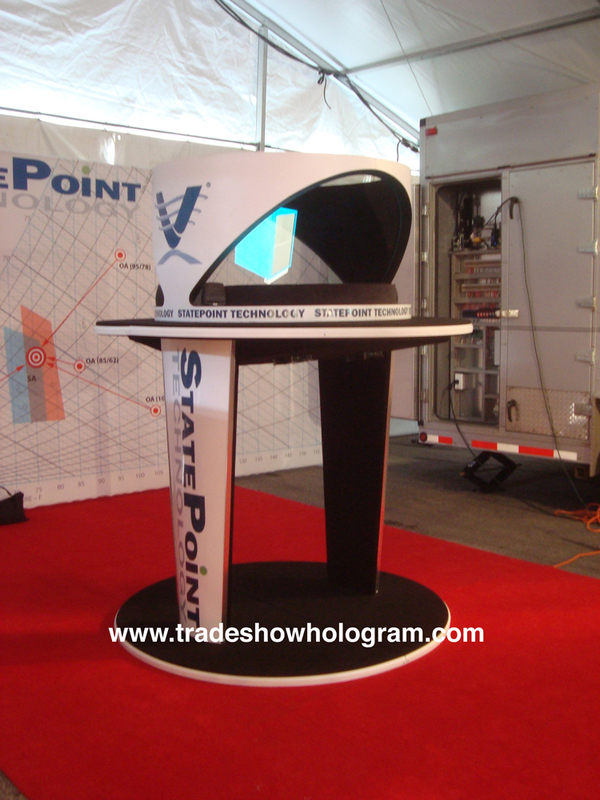 Trade Show Holograms has offered hologram projectors and custom exhbits for sale and for rental for over 7 years. Hologram sizes range from standard sized to ultra large at 7 ft tall and 20 ft wide. The company had produced holograms for trade shows, press conferences and media events since 2006. 3D Hologram Projector projects 3D images floating in mid air! 3D Hologram Projectors display Holographic Images floating in mid air at trade shows. Trade Show Holograms has spent the last 6 years creating custom 3D holographic projections and hologram projectors for trade show exhibitors across North America. The company offers hologram exhibits for rent or for sale. Holograms range in size from 6 inches tall to a life sized 6 ft tall image. Holographic projections can be up to 10 ft wide but the company will soon debut an extra large 20 ft wide hologram. Several custom holograms can be seen in this featured video.